The engineering staff of voestalpine Precision Strip WI in our site in Wisconsin has a combined more than 60 years of experience in the special niche of the precision strip steel industry, especially in the field of hardened and tempered products. 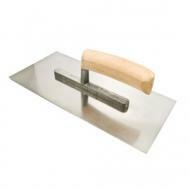 Mechanical trowel steel is used to fabricate trowel blades for motorized concrete surface finishing machines. The material is stamped into blades which include the blanking of mounting holes. The blade is also formed, -i.e.-, bent at an angle along the length of both edges. The blades end up mounted in a finishing machine which is used to smooth out the surface of concrete floors after pouring. High hardness and uniform structure are critical for good wear resistance and even wear when working with the rough concrete surface. In addition to the uniformity, a fine grained structure is necessary for the blanking of these rather heavy cross sections. Smooth edges are important for an even floor finish. Standard thicknesses 0.062", 0.074", 0.082" and 0.092"
Standard widths 6.000" and 8.125"
Taping Knife Steel is used to manufacture Taping Knives for use in mounting drywall. 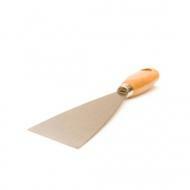 The knives are used to smooth the seams at adjacent drywall panels. Standard Widths 3.875" and 5.000"
Used to manufacture Hand Trowels used in the manual finishing of concrete floors and in the spreading of adhesive used in laying ceramic tile flooring. Standard Thicknesses 0.020" and 0.026"
Standard Widths 3.500", 4.000" and 4.500". Our success originate from worldwide and continuous growth. But not at all cost!